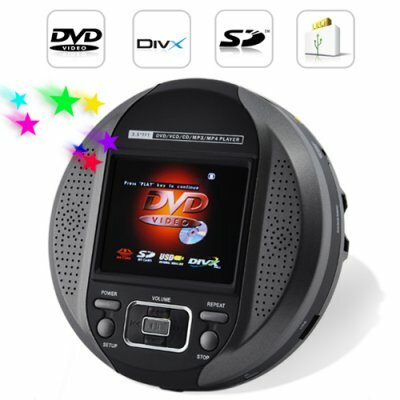 Successfully Added Portable DVD Player - DVD/DIVX/CD/Media Player with 3.5 Display to your Shopping Cart. Feature packed compact-sized Portable DVD Player. Ultra small and lightweight, this new mini-sized Portable DVD Player with a built in 3.5 inch LCD is perfect for anyone needing a DVD / CD / MP4 / MP3 player that can be used on the desktop, in bed, or wherever your travels take you. Everything that anyone could possibly want in an ultra Portable DVD Player Player is all here, and it even includes a AV OUT function so you can hook this up to your TV and use this as an extra convenient DVD player for your bedroom television set. The CVNL-E64 is a digital media player that makes you remember why portable CD players were so popular in the late 90's - you get the ultra high quality music and video experience you can only experience with disc based media, but now you have it in a portable device that is truly travel sized! This new feature-rich Portable DVD Player is in our warehouse right now, so place your single piece or larger order today and we will ship it out within 24-hours! Straight from the factory to you, only at chinavasion.com! When using this portable multimedia disc player to listen to MP3 files off an SD card then it will run for many hours (12+). If you are using this as a portable DVD player to watch a movie off of a DVD disc, then the batteries may last 90-120 minutes. When this Portable DVD Player is running from its battery, how long will the power last? It depends on the feature being used. If you are using this as a portable media player to playback MP3 files off an SD card or USB flash drive, then it will run for many hours (12+). If you are using this as a portable DVD player to watch a movie, then the battery may last 90-120 minutes. What makes this Portable DVD Player better than others I see on your website? Well, if you want a unit with a small footprint that can be easily put on your desktop or used while you are lying in bed, then this is the best choice for you. In addition, if you are someone who misses your old portable CD player, then this will make a great replacement that you can use to play your music CD's and has the added benefit of being able to playback other file and memory card types. Yes, this unit plays MPEG4 files, which usually have the file extension of AVI or MP4. It also plays Divx and other popular video download file formats.